We love a juicy, well-cooked (though not well-done!) steak. When you’ve got a quality piece of meat, you don’t have to gussy it up with complicated cooking techniques and extravagant sauces—and that’s precisely why we love it. It’s simplicity at its best: just good, old fashioned, unfussy eatin’. So why is cooking a steak so darn difficult? From a tragically gray exterior to an overly-cooked inside, there are so many ways to go wrong. But fear not! Our experience is here to help. CQMeats Owner Sandy Seyfert walks us through the art of cooking the perfect steak, whether it’s a porterhouse, a hanger, or filet. Ready to cook some seriously awesome beef? This is your time to shine. A steak is not a steak is not a steak—meaning a butcher can really help you navigate the tricky waters of what cuts to try and how to cook them. Shopping for meat at a grocery store will leave you with the usual suspects, but a butcher can introduce you to newer, supreme cuts that boast huge flavor, like hanger and flatiron steaks. Don’t be afraid to ask your butcher questions about how he or she would cook the steak—that’s exactly what they’re there for! Whether you’re cooking a thin strip steak or a thick porterhouse, you’ve gotta plan ahead, and that means taking it out well in advance of actually cooking it. So how long is “well in advance”? For the thinner cuts, a half-hour on the counter will do. If your steak is over an inch thick, plan on at least an hour—and even up to two. Why does this matter? If you dive right from the fridge into the pan, you’re risking an under cooked steak with a gray exterior: decidedly not delicious and definitely unappealing. When it comes to seasoning, this is not the time to be shy. Sandy explains that in addition to aiding in the formation of a gorgeous crust, it’s necessary for big, bold flavor. “You can’t season the inside of the steak,” she says. “So you’ve got to aggressively season the exterior.” This is not, however, a pass to get crazy with spice rubs and other “creative” seasonings. When you’ve got a good steak, you’re going to want to taste the steak, says owner Sandy Seyfert. So go for coarse kosher salt and black pepper, and season with wild abandon: You should be able to actually see the salt and pepper. Don’t be afraid of a ripping hot (heavy-bottomed, cast iron) pan—Sandy even allows for a little smoke. 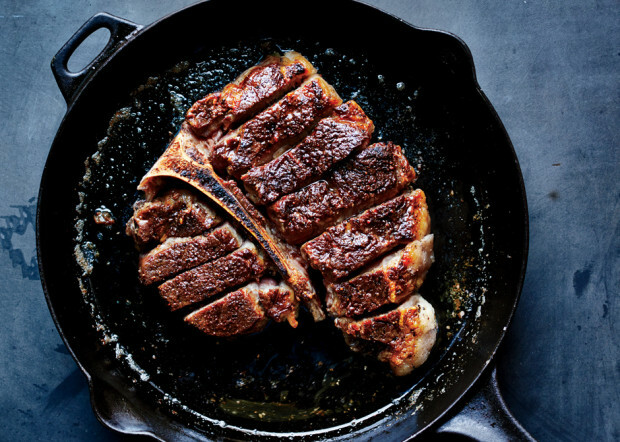 To make sure your fat doesn’t burn, sear in an oil with a high smoke point, like vegetable oil or grapeseed oil (you can always finish with a knob of butter in the last few minutes and baste the steak in it). Now, that said, don’t get crazy on us: for a thick steak, you’re going to want to turn down the heat a little; if you don’t, you’ll risk a gorgeous crust and a raw interior. Some chefs can tell when a steak is done just by feeling it. Great! For the rest of us, however, that’s a little trickier; it takes a ton of practice. Sandy is a big proponent of the thermometer. “Just take the steak’s temperature,” she says. “And know for sure.” On that note, what happens if the steak’s got a gorgeous crust, but the temperature clocks in at 90 degrees? First off, don’t sweat it. Second, take it off the stove top and pop it in an oven set to 400 degrees on a roasting rack set over a baking sheet. It’ll finish cooking without getting too dark. 6. It’s Gonna Get Cold! You’ve heard it before, and we’re gonna say it again: Don’t slice into that steak right away. It absolutely needs time to rest, and let the juices redistribute. For thin cuts, 5 to 10 minutes will do; for larger, thicker steaks, plan for 10 to 15. Repeat after us: Your steak will not get cold. You’ve come so far! Don’t saw at your steak like a lumberjack with a dull blade. Sandy explains: Make sure you cut perpendicular to the steak’s natural grain. It’ll slice easier, look prettier, and taste better. Win-win-win. Hey, we get it: There’s a lot of anxiety about cooking the perfect steak. And when you spend a fair amount of cash on a piece of meat, you want to treat it right. But a juicy, awesome steak isn’t just something for restaurant chefs—it’s something worth learning and having in your cooking repertoire. © Copyright Custom Quality Meats. All Rights Reserved.